Use your writing as a launching point for supporting the growth of literacy and language development for both individual children and the whole class. One at a time, invite a few individual children to the board so they can share with you and their classmates what they know. They can select a letter, a word or a mark of punctuation. Through scaffolding, you move them from what they know to new understandings. Be certain to always connect their new understandings to previous skills. This type of scaffolding allows you to meet the needs of individual learners and help them grow on their unique path. After working with a few individuals, engage all the children in your class in a mini-lesson that matches your primary literacy objective. Be certain to consider the language supports you will need in order for your children to participate fully in the mini-lesson. Your mini-lesson should be brief, focused, and interactive. Let the children know the purpose of the mini-lesson and how it will help them as readers and writers. 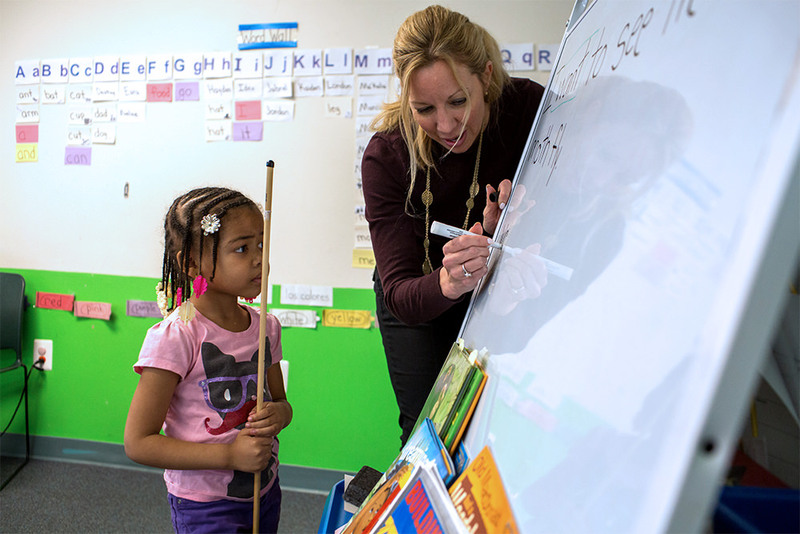 When all children are engaged in the mini-lesson, you can determine if the primary literacy objective was met and can plan future instruction. One final re-read allows children to strengthen their fluency and comprehension of the piece whose elements have been thoughtfully examined. Creating a community where children feel comfortable sharing what they know, learning, and taking risks in front of their peers is important for their growth and development. It’s also important for creating a culture of literacy in your classroom, one in which the appreciation of trial and error and inquiry are welcomed and appreciated. During scaffolding, your goal is for your children to feel empowered to think critically, knowing that they have the support and encouragement of you and their classmates. The scaffolding experience should guide, support, and challenge children, not frustrate or embarrass them. Teach the class how to act responsibly and courteously when an individual is being scaffolded Teach explicit lessons on how children can behave on the rug when a child is up at the board. For example, you can teach children to put their thumbs up if the child at the board finds something in the message that they know as well. Be prepared to scaffold. The more you know about the individual needs of the children at the board, the more efficiently you will be able to scaffold them and they will leave the board feeling successful. Have your planning materials beside you (e.g., your assessment binder, your scaffolding notes, your lesson plan). Use the appropriate level of teacher support, and range of scaffolding options, in order to make this happen. Have manipulatives ready and nearby so you can access them if necessary. Celebrating your children’s efforts and accomplishments helps them feel good about themselves and their learning. It also helps to create a warm, positive tone in your classroom. After you scaffold individual children or at the end of your lesson, use a cheer to send the message that you are proud of them. Tip: You can choose the cheer yourself or have the children choose the one they want to hear. A nearby chart that lists cheer options would be helpful! Scaffolding is an instructional technique that you can use to help your children’s skills grow within their zone of proximal development (ZPD), a term coined by psychologist Lev Vygotsky. The zone of proximal development is the “sweet spot” just beyond what children can do independently and what they would feel frustrated doing independently. When you scaffold children, you build upon what they already know and help them reach new understandings that they wouldn’t be able to reach independently. Think of a rubber band - if you pull it too hard, it snaps (frustration). However, if you don’t pull it at all it doesn’t work (too easy). The rubber band needs to be stretched just enough to work without snapping (ZPD). In this video, a teacher demonstrates various strategies that can be used to scafold children during MTP. When you scaffold an individual child during MTP, your goal is to start from something the child knows and support them in learning something new. Begin by inviting and welcoming an individual up to the board. Set the tone for a positive experience by asking them to point out something that they know in the message. Giving them the opportunity to share their knowledge is an empowering experience. Children also know this is the time when they will learn something new so follow up by asking open-ended questions and using other types of support. Celebrating their efforts and helping them take risks in reaching new levels of understanding works towards creating a culture of literacy in your classroom. Below are several examples of different types of support you can offer children while scaffolding. It seems like you could use some help making a sentence with the word camouflage. How about I start and you finish my sentence. I could hardly see the ______. What two vowels do you think go together to make the long /a/ sound? Can you find one of those vowel pairs in the message? Let me write a capital “D” for you so you know what it looks like. Now, can you find another capital D in the message? On the word wall? If I was trying to figure out what a capital D looks like, I would use the environmental print around the classroom. The word wall would be a good place to start because I know that all the capital and lowercase letters in the alphabet are on the word wall in alphabetical order. Can you help me read the letters until we find the capital D? Let me show you what beginning, middle, and end are so that you can find it in this word. Look, here’s your name, Rob. The R is the beginning. The B is the end. All the other letters are the middle. Now, can you show me the beginning letter in your word? Tip: Keep this chart beside your board when scaffolding. Refer to it when working with individuals in order to find the type of support that best fits the need of each child. Call and Response Encourage the children to respond to the work on the board. Child (Jeremy) at the board says: I found the letter J. Children on the rug say: Jeremy found the letter J. Good job, Jeremy! Sam just found the letter S. If you can find another S in the message, put your thumbs up. Joe just found the word “remember.” Joe, will you clap the syllables in the word “remember?” Class: Will you clap the syllables in the word “remember” now? Sara found the word “hat.” Think of two words that rhyme with hat. Now share these with your partner. Using songs is a tried and true method for helping children strengthen their phonemic awareness and phonics skills. If you are exploring rhymes or word families during scaffolding or your mini-lesson, create a list of six words with the same ending sound. After you have written these words below your message, encourage the children to sing the Rhyme Time song to reinforce the pattern. Insert any word family here. There’s cat and there’s bat. There’s hat and there’s fat. There’s sat and there’s pat. When you scaffold, there are a number of questions you can ask a child. Thoughtfully consider what it is you want that child to learn and use questions that lead you towards that area of literacy. Remember, your goal is to have each child learn something new. Below are examples of questions you can ask that cover a wide range of literacy skills. These are intended to show you the range and variety of areas you can teach into and the kinds of questions that fit. As you practice scaffolding, you might find yourself asking each child many questions as you seek out their zone of proximal development. However, as you become more practiced in scaffolding towards their individual needs, you will probably find yourself able to reach a child’s zone of proximal development within two to four questions. Choose the question or questions that make the most sense based on the individual child’s needs and zone of proximal development. How many sounds do you hear in that word? If I put the __ sound in front of that word what would it be? Do you know any words that rhyme with that word? What sound do you hear in the beginning of this word? In the middle? At the end? Are there any words in our message that rhyme with that word? What other words do you know that rhyme with that word? What other words do you know that have the same beginning sound? Ending sound? What letter does the word start with? End with? How many letters are in that word? Can you find/think of another word that starts with the same sound? What would the word be if I changed this letter to another letter? Does this word have a short or long vowel sound? Can you blend/segment the sounds in that word? Can you say the name of the letter? Can you find the same letter in upper/lowercase? Can you find this letter in your name? Can you find that letter in the room? In the message? Can you think of a word that starts with the letter/sound? Can you make the letter sound? Is that letter in the beginning, middle, or end of that word? Can you give/find another word that starts/ends with the letter? Does this word have a short vowel sound or a long vowel sound? Are there any other words in our message with a similar letter pattern? Why does this word begin with a capital letter? If children have a different home language: Does this letter make the same sound in your language? How is it the same? How is different? Can you say the letters in that name? How many letters are in that name? What is the first letter of the name? What is the last letter of the name? Why does that word start with a capital letter? Does anyone else’s name start with the same letter? Can you find that name anywhere else in the room? Can you find this word in our room? On our word wall? Can you find this word again in the message? Can you tell us some words that rhyme with this word? Can you “snap and clap” that word for us? Can you teach your friends how to spell it? Can you read that sentence with expression? Can you read that sentence as if you were talking to a friend? How does that mark of punctuation change the way we read that sentence? Can you read that sentence and the restate it in your own words? What kind of mark did you find? What does it tell us to do? Can you find this punctuation mark somewhere else in the message? Can you find a different punctuation mark in the message? How does the punctuation mark affect the way we read the sentence? Can you use that word in a sentence? Can you act out that word for me? Have you heard or seen this word before? Where? What is this word in your home language (if other than English)? Does the word mean the same thing in this example (offer another example)? Do you see this word somewhere else in the room? Can you think of another word that has a similar meaning? Can you think of another word that means the opposite? Can you tell me what you just read in your own words? Can you summarize the message? What is the main idea of the message today? What connections can you make to today’s message? What vowel teams can you find? What is the base word in that word? What blend does that word start with? How many sounds do you hear in this word? Can you find or think of a word that rhymes with this word? Can you think of or find another word that starts with the same cluster of letters? Is that word singular or plural? Why does this word start with a capital letter? What part of speech is that word? What two words are inside this compound word? Can you find the homophone in my message? Can you find the homograph in my message? Can you read that sentence as the author would want you to read it? Have you heard this word before? Where? Can you think of a synonym for that word? An antonym? Read the entire sentence. Are there any clues in the sentence that can help you figure out what that word means? Can you tell me what happened at the beginning (middle, end) of my message? Did I include a word in my message that helped you to visualize? What did you infer from this sentence? What did you infer from this phrase? What was my purpose in writing this piece today? How was my writing similar (different) from my writing yesterday? Keeping records during scaffolding is very important. What children show you they know or have learned will help contribute to a comprehensive picture of that child’s reading and writing skills. Information gathered during scaffolding can inform your work with this child in other areas such as Guided Reading or Reading Workshop just as data collected in these practices and other practices can inform your decision-making when planning for scaffolding. Tip: Keep these records in the same assessment binder where you store all your informal and formal records such as anecdotal records and conference notes. In this way, all your data on your children are in one, easy to find place. MTP is an incredibly useful instructional practice because it allows you to teach into a wide range of literacy skills. Your mini-lesson is your opportunity to help children gain exposure to and practice with one specific literacy skill or strategy that was embedded into the content of your writing. Over the course of time, varying your primary literacy objective and the way you engage your children will help to maintain their interest and preserve the energizing quality of MTP. Letter Knowledge Categorize letters by features (slants, circles, tails, etc.) Use a pocket chart to make columns. Give each child an alphabet letter. 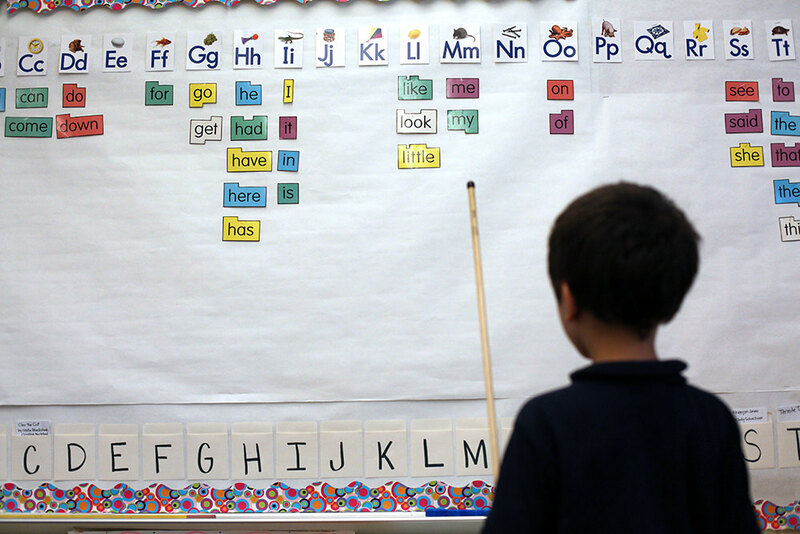 Children place letters in corresponding column. Letter/Sound Relationships Recognize and use beginning consonant sounds and the letters that represent them to read and write words Distribute white boards and markers. Point out one letter to focus on. Children copy the letter, say its sound, and copy the rest of the word that the letter is in. Repeat with other words in the message that start with the same letter. Spelling Patterns Recognize and use the CVC pattern (cab, map) Choose a word from the message with a CVC pattern. Have this word pre-written on three cards with the vowel in red. Model how to assemble these letters according to CVC pattern to spell “bed.” Then give out three new letters (that you have already pre-planned as a CVC word) to three children. Ask children to use the CVC pattern to spell the new word. High Frequency Words Write and read a core of high frequency words Have children face the word wall with the lights off and play the “flashlight game”. Word Meaning Recognize and use concept words Write concept words on cards. Show one card and model how to use the word in a complete sentence. Let children sit with a partner. Ask them to make up sentences with various word cards you show and share with their partners. 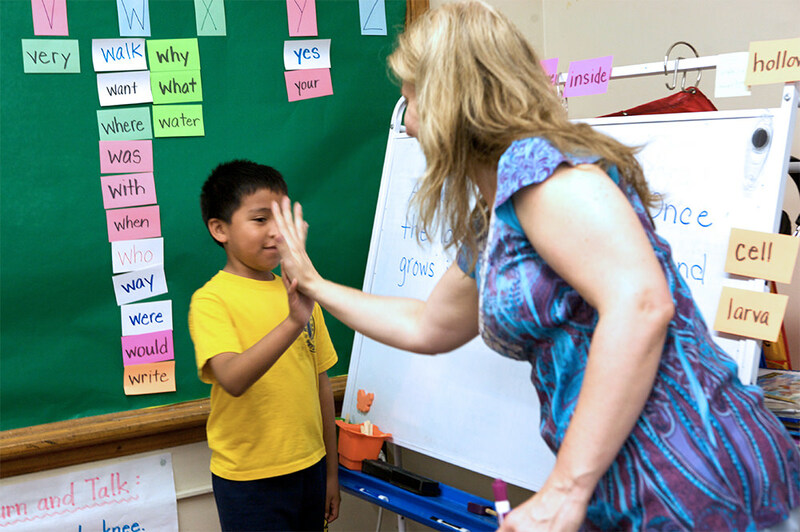 Vocabulary Understand the definition of new words Invite children to act out the meaning of new words. Word Structure: Syllables Understand the concept of syllables and demonstrate by clapping Select a multi-syllabic word from the message. Read the word and demonstrate how to clap each syllable. Have the children try with other words. Word Structure: Verb Endings Recognize and use endings that add –ed to a verb to make it past tense Show a pre-made chart with two columns – one column labeled “present tense” and the other column labeled “past tense.” Show the children a word (e.g., played). Ask them to hold up one finger if it is a verb in the present tense or two fingers if it is a verb in the past tense. Repeat with several verbs. Word Solving Actions Use known words to help in spelling new words Distribute individual wipe off boards. Find a word in the message that children know (and contains a pattern they are familiar with, e.g., bat). Write it at the bottom of board and ask children to copy it on their boards. Explain that they will be changing the beginning letter to make a new word. Give children a new beginning letter and ask them to write the new word (use h to make hat). Comprehension Making inferences Distribute individual wipe off boards. Children write on the board what they inferred from your message. As Patricia Vitale-Reilly explains in Engaging Every Learner, engagement is the act of being invested in learning. Children can be engaged in the classroom on many levels. For example, they can be behaviorally engaged, which means they are participating and focusing and following classroom procedures. They can also be cognitively engaged which means they are actively thinking, reflecting, and challenging themselves. They can also be emotionally engaged which means that are interested in learning and connecting with you and their classmates. As educational research demonstrates, the more time children spend engaged during instruction, the more they learn. Therefore, when you plan your mini-lessons, take the time to plan how you will engage your children. There are many engagement strategies you can use. Consider which engagement strategy best fits your goal when planning. Varying the types of mini-lesson you do will also aid in making sure MTP remains a thoughtful and engaging practice in your room. Call and Response Encourage the children to respond to a question you pose. We are learning the difference between the sound the long e makes and the sound the short e makes. I am going to show you a word. I will say the word. You can call out “long e” if you hear the long e sound. Or, call out “short e” if you hear the short e sound. Sing Teach and use songs that help children remember important literacy skills and concepts. We have six words that all belong to the same word family. Let’s sing the Rhyme Time song for the “-at” family now. Think and Signal Ask the children to use non-verbal signals to show you what they are thinking. Non-verbal signals may include a “thumbs up” when they have an idea or a nod of the head. Use Movement Give children the opportunity to move their hands (e.g., clap or snap) or move their bodies by suggesting they participate in a cheer or act out what a vocabulary word means. We are learning what verbs are. I’m going to show you a sentence I wrote on a sentence strip. In it I wrote a word in red. If that word is a verb, an action word, I want you to pump your arms as if you are running. Think, Turn, and Talk Partners quickly turn and talk to share their ideas. We are learning about words that begin with the blend “sp.” Think of a word you know that begins with that blend. It can be in the message or from your brain. Now turn to your partner and share. OK, now turn back to the board and share what you talked about. I’ll make a list on the board. Write Write their ideas using either a wipe-off board or a notebook. They can also use “invisible” ink by skywriting or writing on the rug or a person’s back. We are learning how to spell the plural of words that end in “y.” I’ll write a word that ends in “y” on the board. You write the plural of that word.